This archival quality reproduction of the painting of Shiwa Okar, Primordial Lha embodying dynamic basic goodness, is particularly relevant as a visual aid to the Werma sadhana, a meditation practice within the graduated training of Shambhala Buddhist meditation. As with the Primordial Rigden tangka painting, the artist C. Moku worked closely with Sakyong Mipham Rinpoche to create this image according to his wishes and within the iconographical standards of Himalayan Buddhist art. 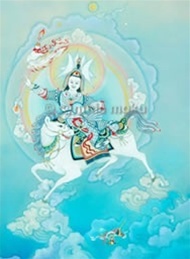 The inaugural print of the first edition was presented to the Sakyong during the week-long celebration of his wedding with Khandro Tseyang Palmo Ripa at her family monastery in Orissa Province, India, during the Losar (Tibetan New Year) celebration of the Year of the Fire Boar, 2007. The original painting hangs in the shrine room of the Kalapa Court in Halifax, Nova Scotia.